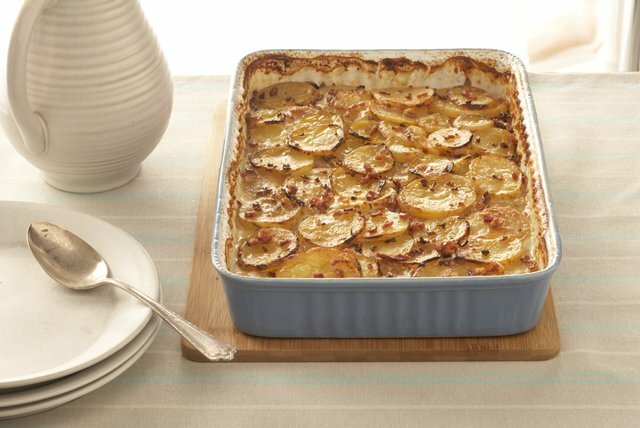 Amp up the cheese factor with this Scalloped Potatoes Recipe. Bring together melty PHILLY Cheese and grated Parm in this creamy, cheesy dish. Cook onions in large skillet sprayed with cooking spray on medium-high heat 3 to 5 min. or until crisp-tender, stirring frequently. Remove onions from skillet. Add cream cheese, broth and milk to skillet; cook and stir on medium-low heat 5 min. or until cream cheese is completely melted and sauce is well blended. Remove from heat; stir in bacon and syrup. Place half the potatoes in 13x9-inch baking dish sprayed with cooking spray; cover with layers of onions and shredded cheese. Top with remaining potatoes and cream cheese sauce; cover. Bake 1 hour 5 min. or until potatoes are tender and top is golden brown, uncovering for the last 15 min. Since this layered potato side dish makes 12 servings, it's the perfect dish to serve at your next brunch. Substitute 1/4 cup OSCAR MAYER Real Bacon Bits or Bacon Pieces for the chopped bacon. Prepare as directed, substituting sweet potatoes for half the Yukon gold potatoes.